Doctors are failing to diagnose some of the sickest hospital patients properly, a study suggests. In some cases, patients are dying because serious conditions, like a heart attack, are being missed. Doctors at Birmingham Heartlands Hospital examined the post mortem results and medical records of 38 intensive care patients who had died. Only 17 patients had been diagnosed completely correctly. Ten may have survived if the diagnosis was better. The author of the report, which was originally published in the journal Critical Care, said the hospital's performance was in line with others in the UK and abroad. "This is a problem everywhere," Dr Fang Gao Smith, an intensive care specialist at Birmingham Heartlands told BBC News Online. "We are not doing anything differently at this hospital. "Other studies have reported similar results in other parts of the UK, in Europe and the United States. In some cases, they have been much worse." Dr Gao Smith called for more post mortem examinations to be carried out on intensive care patients when they died to enable doctors to learn from their mistakes. She originally looked at 636 intensive care patients who died over three years. However, post mortem examinations were carried out on just 49 of these patients. Full medical records could only be obtained for 38. "Post mortems are important. They enable doctors to check they have diagnosed and treated patients properly," she said. Professor James Underwood, president of the Royal College of Pathologists, said it was often difficult to accurately diagnose intensive care patients. "We have suspected that 30% of diagnoses may not be correct," he told New Scientist. "That's not to say doctors are not doing their jobs properly. It's just that even with all the high-tech equipment we have now, it's not always possible to make the correct diagnosis." 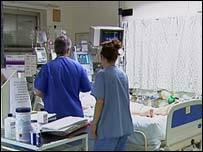 Dr Saxon Ridley, president of the Intensive Care Society, said other studies had come up with similar findings. "This research would appear to confirm earlier studies that missed diagnoses are frequent," he told BBC News Online. "The clinical picture presented by critically ill patients is complex. In many cases, they are so ill it is difficult to carry out all of the relevant tests so diagnosis can be difficult."